The photovoltaic (PV) industry appears set to achieve a major milestone with the selling prices of crystalline silicon (c-Si) modules projected to drop to $1 per watt by the first quarter of 2012, a significant benchmark level that could forestall a widely feared dip for solar installations next year and stimulate demand instead, according to new IHS iSuppli (NYSE: IHS) research. An assessment of this magnitude, bold in its purview and implications, comes in the wake of an accelerated, rapid decline in pricing for deals following the Intersolar Trade Fair, site of the world’s largest PV exhibition, held last week in Munich, Germany. Going into Intersolar, spot prices from the top Chinese brands, among the major players in the market, had been running at $1.49 per watt for mainstream c-Si modules. By the time Intersolar wound up, prices had fallen to $1.30 per watt, ostensibly hastened by the market’s fear toward a flat—or worse, negative—market in 2012. “The recent price decline was quickened by top-tier module brands dropping prices to aggressively position themselves, in the face of fears that the industry could be headed toward a down market next year,” said Henning Wicht, senior director and principal analyst, photovoltaics, at IHS. The drops in pricing were spurred by the recent price slide in cells and wafers, with wafers being quoted in the $2.30 per-piece range, down from $3.50 in March. 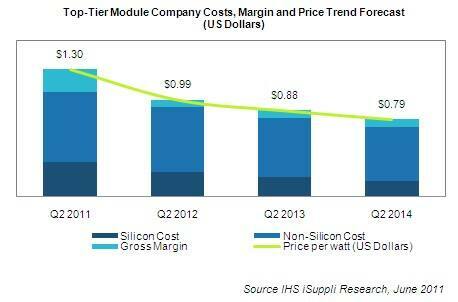 The figure shows the IHS iSuppli outlook for the cost of both silicon and non-silicon content, gross margins and prices from top-tier module players, covering the second quarter for each year from 2011 to 2014. While gross margins are projected to range between 10 to 12 percent this quarter, the intense competition in the space will slash margins to between 5 and 9 percent by the second quarter of 2012, IHS iSuppli research indicates. Solar Implications: Bright days Ahead? Another interesting discussion at Intersolar was whether the vertically integrated business model that washed across the PV industry will continue to flourish, even as margins get compressed in this round of price cuts. Can a vertical operation invest in wafers, cells and modules on the one hand, finance downstream projects on the other, and also continue to run world-class operations at each level? After margins are cut, it will be much more difficult for such vertically integrated operations to sustain the competitive advantage that they once enjoyed, IHS believes. Though many vertical operations will continue to thrive, the space likely will find increased competition from another breed of player—the so-called specialists that will be able to aggressively invest in just one area, and more important, hold their own against their vertically integrated rivals.